ITS A BLAST FROM THE PAST!! 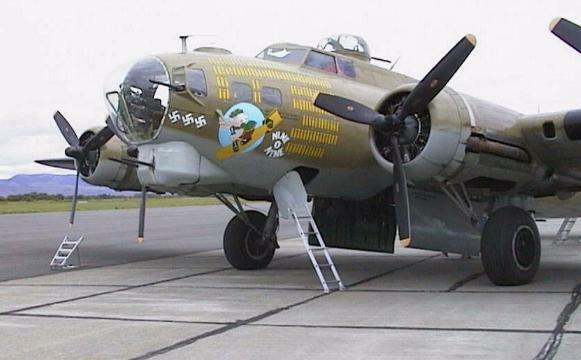 The B-17 and B-25 toured the USA some years ago giving rides on and tours through 2 remarkable vintage aircraft. Your striving webmaster, being temporarily exiled from paradise, found these amazing aircraft in Ellensburg, Washington. Unfortunately, the local weather was up to it's usual tricks - high of 52, 30 - 40 MPH winds and scattered T-storms. The 25 didn't arrive as they didn't want to risk it, the only flyable example left. But the old Boeing B-17 drops on a dime, so it made it. I had hoped to get a ride for this page, but as there were lots of paying customers and only one of two aircraft available, I missed out! So heres a groundpounder's view. This is a virtual tour - I have thumbnails of the shots of the plane and the info here, you may click on these to see a larger image if you wish. Use your browser's "back" button to return. Have fun, I did! This B-17 is restored as "old nine-0-nine", ready for you to get on board. Her history was amazing. As a member of the 91st bomb group, 323rd squadron based at Bassingbourn England she flew 140 combat missions over Europe. Here we see the view forward from the bombardier's position in the nose. 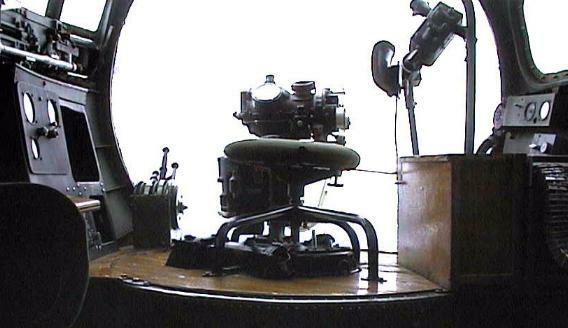 The famous Norden bombsight with which you could "drop a bomb in a pickle barrel" is in the center. This is the prime view spot, 180 degrees! Up and aft of the bombardier are the pilot and co-pilot. 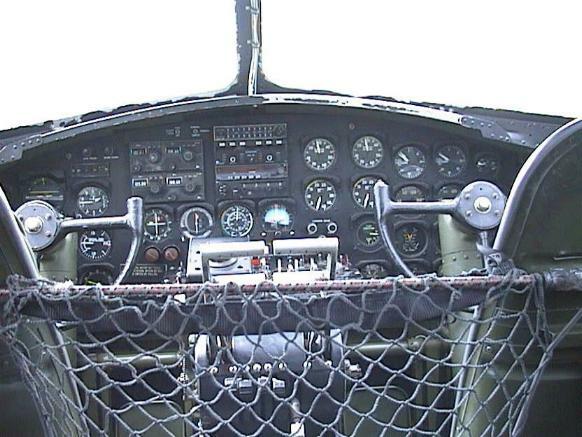 Here you can see the instrument panel and associated controls. Complex perhaps for the day, but basic compared to a modern aircraft. The netting is to keep us groundies out. 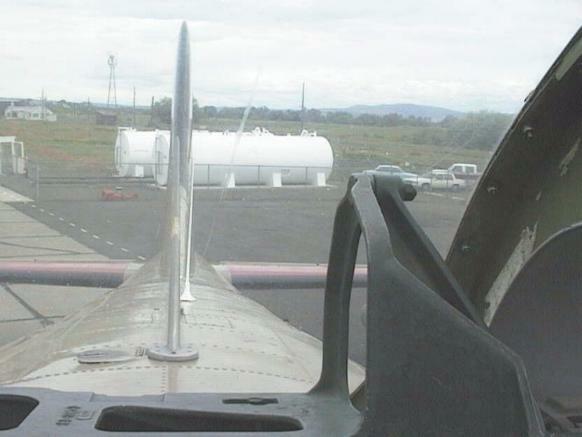 Right behind the pilots seats is the top turret platform. Just like "Star Wars" it pivots and rotates 360 degrees for coverage on top. A better movie comparison would be the classic "Memphis Belle" the saga of events surrounding another 91st group aircraft. 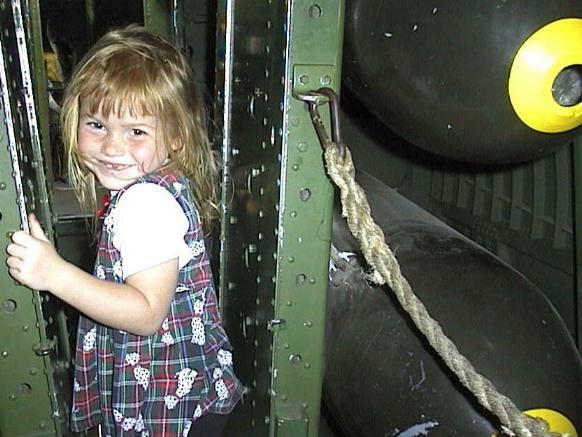 Here's my fearless then 5-year-old granddaughter walking the catwalk back through the bomb bay to the aft portion of the plane. Thanks to these old war horses and the brave men who flew them into battle she lives in a better world. Lets keep it that way!! 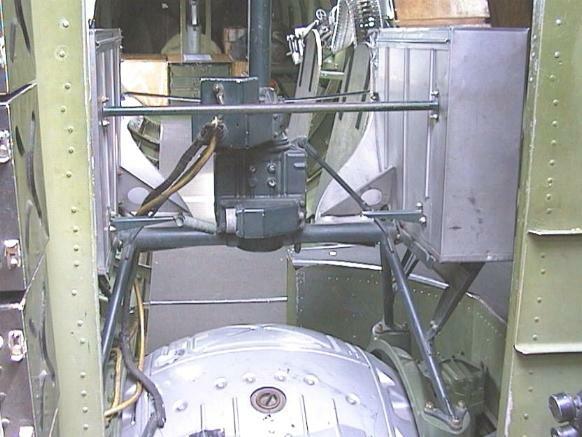 This is the lower ball turret, located immediately aft of the bomb bay, the operator boarded this before takeoff and there is no access to the rest of the plane. So I guess he was a strong supporter of good landing gear.